Pyranochromen-2-ones are the class of chromen-2-ones which contain a pyran ring fused with that of chromen-2-one. Pyranochromen-2-ones and their analogues are a large class of compounds that have attracted the interest due to their biological activities and have shown few medical uses as pharmaceuticals, such as in the treatment of lymphedema. They also have ability to increase plasma antithrombin levels. 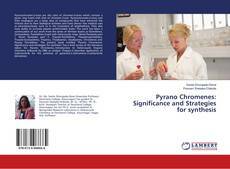 The work has been a continuation of our work from the series of thirteen books as Pyrimidines, Quinazolines, Pyrimidines fused with heterocyclic rings, Novel Pyrazoles part I, Novel Pyrazoles part II ,Triazolo-Pyrimidines, Thiazolo-pyrimidines, Triazolo-Quinazolines, Triazines, Thiadiazines, Oxadiazines, Chromenes and Pyrano Pyrimidines. The present book entitled “Pyrano Chromenes: Significance and Strategies for synthesis” has a brief survey of the literature taken for Pyrano Chromenes, Introduction to Heterocyclic Organic Chemistry followed by DBN as catalyst. Chapter-4 describes application of malononitrile for the synthesis of pyrano[3,2-c]chromene-3-carbonitrile derivatives.